We've explored Reykjavik and environs along with the Golden Circle in the first part of our 5-day winter itinerary for Iceland. Let's continue by heading east along the country's Ring Road to explore some of the jewels of South Iceland. There's a lot to see in this part of the island and several spectacular attractions. 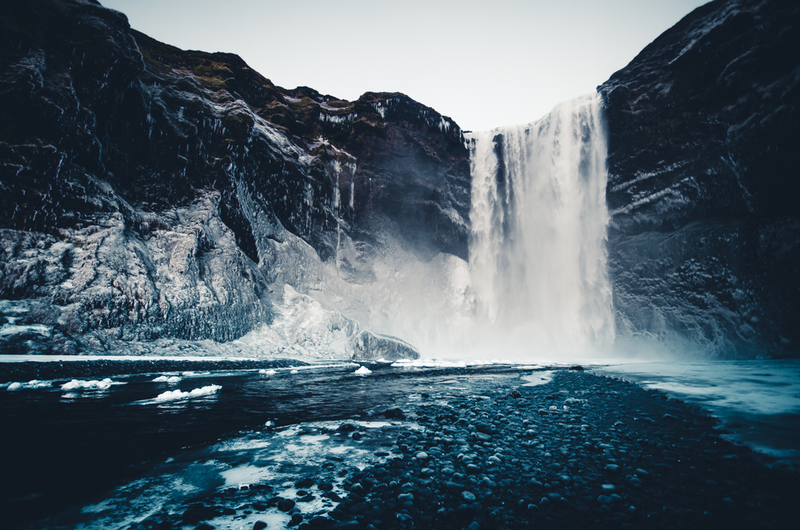 From Iceland's most beautiful waterfall to the black sand beaches you'll see in glossy travel magazine layouts, this area has so much to offer. It's no surprise that this is one of the most popular zones in the country. The South is even more beautiful in winter when its mighty, flowing waters are suspended in a frozen state of animation and pristine white snow blankets the ground. Let's find out what there is to discover in this unique part of the globe. Alright, let's start driving in Iceland along the South Coast for the third day on our itinerary! There are few things to note about this popular Iceland attraction. The first is that it's considered to be one of Iceland's most beautiful waterfalls, if not the most beautiful. The second is that while this particular waterfall does not freeze in the winter (unlike Gullfoss, which we saw in the Golden Circle), it is still quite the sight to behold in the winter. 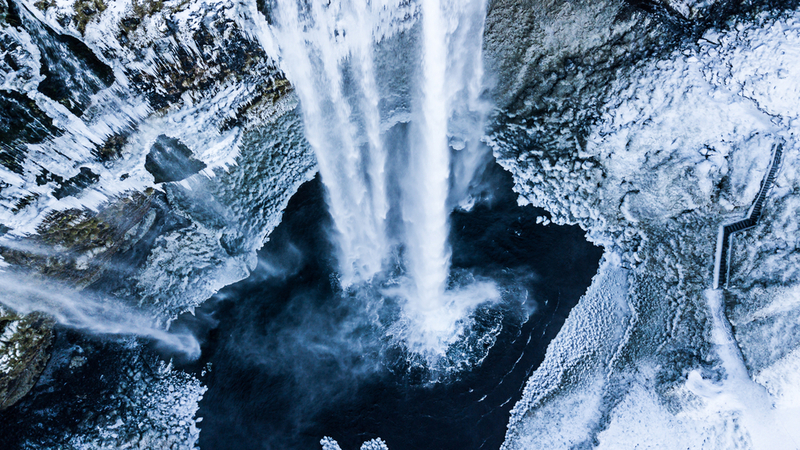 Water rushes from the top as icicles hang from its cliffs while packed snow and frozen ice bubbles line the bath below. If you've got a good pair of hiking boots and sure footing, you can make your way around the waterfall to the cave that sits behind the cascade for incredible and unique views. This natural wonder lies 79 miles (128 km) southeast of Reykjavik on the Ring Road. You will reach it in about two hours. Continuing along the Ring Road towards Vik, we find another iconic Icelandic waterfall: Skógafoss. This powerful and mighty cascade has such a tall drop, that when it pounds into the waters below, it frequently produces a spray with a double rainbow. Feel the excitement and awe as you approach and be wowed as the water crashes after making a nearly 200 foot (60 meter) descent. If you got some extra time on your itinerary and you want to check out something really cool, be sure to stop at the DC-3 plane crash site at Sólheimasandur beach in South Iceland. The wreckage of a US Navy Douglas Super DC-3 rests on the black sand beaches of this remote zone. The contrast of the white fuselage of the plane set against the midnight black hue of the sand makes for quite the haunting image. This popular tourist attraction in Iceland is a 45-60 minute walk from the main road where you are required to leave your car. If you think you’ll have enough daylight in the winter and don't mind walking for two hours in the cold, this stop will be a memorable experience on your trip to Iceland. We've reached our last stop for the day and the place where we will spend the night: Vik. The small fishing village of Vík í Mýrdal has only about 300 residents and is the southernmost town in Iceland. 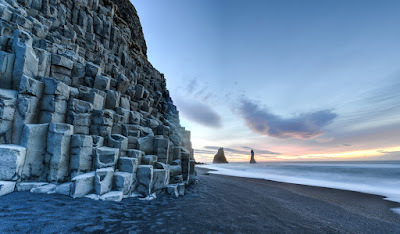 Despite its small size, this haven by the sea has become a destination for travelers looking to recharge their batteries and explore the nearby volcanic beaches and geometric basalt columns at Reynisfjara Beach. This is considered to be the best black sand beach in Iceland and was also featured on Game of Thrones. Fans of the popular television series will recognize it as part of Eastwatch By The Sea, one of the bastions guarded by the men of the Night's Watch. Keep in mind that sunlight hours are greatly reduced in Iceland during winter. The sun normally rises close to 11 am and sets by 4 pm. Make sure when planning your drive times and routes that you leave enough time at the end of the day to explore this area. If you don't get the chance to do so, make sure you visit the following morning before continuing on towards Vatnajökull National Park. After you checked into your accommodation in Vik, it's time to have dinner and rest up for tomorrow's big day out. You're going to need your energy as you will be hiking on a glacier. Get lots of sleep along with a hearty meal to give you strength for the day ahead. Well, it's been quite a day. You've seen some of Iceland's most iconic sites and popular attractions. Hopefully, you have gone to bed with a full, happy tummy to accompany the wonderful memories you've made today. See you tomorrow when we visit Jökulsárlón Glacier Lagoon and hike the massive Vatnajökull glacier!